Pistol Cases are weather sealed to keep out dirt and moisture. Intended for competitive shooters, armory, agency, training, and range personnel who need multiple pistols, Ultra-Lite Series includes 4-pistol case weighing 6 lb and 8-pistol version weighing 9 lb. Each has 2 loop latches that can be padlocked. Interior is bordered by 1 in. high density cushioning, while pistol/accessory compartments are carpet lined. Additionally, each case comes with 2 handles, one on top and one on case front. Waxahachie, TX - Americase, Inc. is very pleased to announce the pre-release of two pistol cases from our forthcoming Ultra-Lite Series of cases - a four pistol case and an eight pistol case. "We designed and built these cases for competitive shooters, armory, agency, training, and range personnel who need multiple pistols day in and day out", said Bill Kinsala, President of Americase. "Each case is built for tough duty but at a much lighter weight than our current pistol cases. In fact our four pistol case weighs only 6 lbs and the eight pistol case just 9 lbs. Each case has two loop latches that can be padlocked. Our customers have been asking for lighter cases and we feel we have accomplished this, while keeping the strength, quality and integrity that Americase is known for." 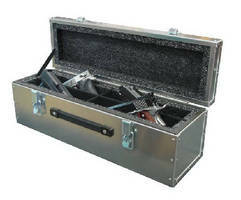 Americase is the premier case manufacturer of airline quality transport cases for Guns, Archery and Industrial equipment. Americase produces commercial carrying cases as well as custom gun cases for shotguns, pistols, rifles, and archery equipment. Cases utilize extruded aluminum and the highest quality hardware available. Americase has been providing Quality Carrying Cases Made in the U.S.A. since 1985.